“Russian authorities have softened their tone on Bitcoin; the central bank now says it won’t hamper the usage of the virtual currency whereas previously it had vowed to crack down on the electronic payment instrument. While is waits to be seen if Russian authorities follow through fully on the back of this rhetoric, what is perhaps of significant value here is the speed in which the stance has changed from the beginning of the year. This may have been contributed to by the rapid speed of developments in the Bitcoin space, especially in regards to its growing legitimacy. We have recently seen the first large and mid-cap companies begin to adopt Bitcoin as a payment method ( DISH, Expedia, Newegg) and many other large cap companies have stated there interest. In addition to this, recent US sanctions against Russia as well as perceived overreach by a prominent US bank could have possibly been taken as another warning that Russia may need a more diverse set of tools to facilitate international trade in the future. This will only be compounded as the existing global financial system becomes more unstable and trust between major powers (especially the US) continues to deteriorate. It will be interesting to see in the near future if this reversal in rhetoric from a superpower like Russia, creates further announcements from governments that have so far been more hardline inclined towards Bitcoin and Cryptocurrencies as a whole. Ever since Bitcoins dramatic conception and explosion in popularity following the 2008 financial crisis; it would be a safe bet to assume that financial incumbents worldwide have had all there top think tanks planning on how they can marginalise, undermine, circumnavigate and prevent one of the biggest black swans in global finance for centuries from coming to fruition. Whilst we don’t yet know the full details or validity of these statements; if they are true, a system of this nature (whilst potentially offering some advantages for traditional currencies) goes completely against the fundamental ideology of the Bitcoin protocol as an open source, decentralised, trust free network. In my opinion, it would not be unfair to interpret this as an attempt by central banks to bootleg the underlying technology of Bitcoin, whilst trying to remain completely in control of the global financial system and monetary policy; which has caused unprecedented mal investment bubbles in recent times. 1) Trust – Any closed proprietary system removes one of the cornerstone attributes of the open source Bitcoin network & currency, which is the universal trust of the network. The fact that Bitcoin is not controlled by any sovereign state or banking entities is one if not ‘its’ killer attribute that provides the network with tremendous potential value and utility. 2) Surveillance/politicised system – Point 1 is exacerbated by the loss of confidence in the US and the US tech industry since the Snowden NSA revelations and the use of back door surveillance in US technology. In addition, nations outside the US are not going to jump at using a new SWIFT’esq system at a time when they are becoming increasingly aware of SWIFT’s ability to be used as a political tool/leverage with regards to geopolitical events such as international sanctions. A great example of this is China’s recent completion of a SWIFT alternative. 3) Innovation – Open source networks such as Bitcoin and the internet create a free market environment that encourages large scale innovation by removing prerequisites for participation in the development of services and Businesses that sit on the network. The result of this is large scale & rapid innovation. A closed proprietary walled garden system such as the one rumoured by IBM could potentially lack the ability to compete with the rapid innovative progression of the Bitcoin economy and infrastructure. 4) Confidence – in Central banking and governments worldwide is on the verge of being decimated. Years of promises that QE would benefit the wider real economy are failing, with evidence of massively deteriorating global macro-economic data in 2015, led by the United States. During the next recession ( which looks to be imminent) there will be no easy policy tools left for the central banks, such as lowering interest rates & there are only so many times you can announce another QE program before losing all credibility. The lessons learned from this monetary experiment could be so egregious and detrimental that people worldwide will be massively sceptical of any monetary system tied to these central institutions in the future. 5) Currency wars – We are currently experiencing an era of large scale & accelerating currency wars worldwide. The race for all fiat indebted currencies to devalue their currencies to relieve debt burden’s and support their global exports has already led to over 20 instances of monetary easing by central banks in 2015 alone. 6) Currency Attributes – Whilst the details are not 100% clear yet on the system reportedly being created by IBM. If the idea of the system is to represent traditional fiat currencies in a tokenised format with an underlying blockchain infrastructure; what will be the attributes of the currencies that operate on this network? Blockchain protocols at their core are monetary systems with unique characteristics that define the desirability of the currency on that specific network/system. Bitcoin is highly desirable because of its finite supply (inflation hedge) low counterparty risk, and open source protocol that provides a level playing field on a global scale. If the traditional government currencies that are to operate on the new IBM system still have the attributes of current fiat currencies such as: infinite supply (through fractional reserve & QE policies). Are still unpredictable and manipulable due to policy oversight by a few individuals and are on a trust based closed proprietary system. Then what IBM system will achieve will only be a fraction of what Bitcoin can offer and currently provides. Due to the nature of good money driving out bad, you would still expect in this scenario for capital flows away from this system and into bitcoin. 7) Time – Bitcoin has already been around for over 6 years and in technology terms that means its potentially nearing the tipping point of ‘S-curve’ adoption. 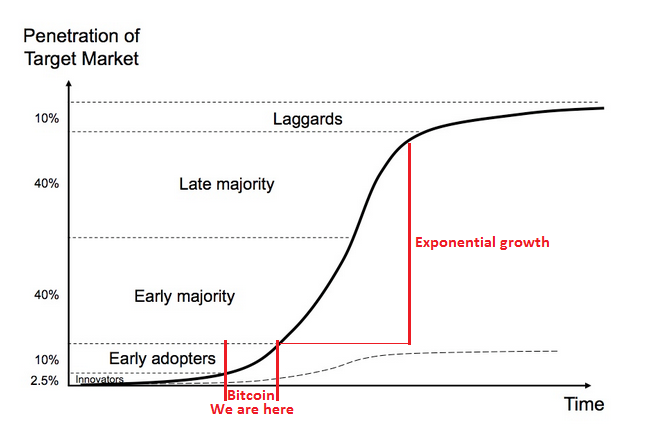 The point where adoption becomes an exponential curve. This happens on average approximately 4-7 years after the technology is created. The longer it takes for IBM’s system to come to fruition, the more chance Bitcoin will have already ready reached its critical tipping point for mass adoption. 8) Revolution – With the relentless militarisation of police forces, the use of armed forces domestically and increasing amounts of legislation to clamp down on protesters and belligerents. Protesting what could be argued the most unbalanced and unfair global monetary system in history, is becoming physically dangerous. It is here where Bitcoin could become the digital revolution, a way to peacefully push back, by deleveraging the out of control current financial system, without having to take volleys of rubber bullets and lung fulls of tear gas, if not worse. As people awaken to the realities of the current monetary system, the anger phase of this awakening is more likely to push people to alternative currencies outside of the current system and away from those controlled by central financial institutions. Since the first day I invested in Bitcoin there has always been two main fundamental reasons that have driven me to Bitcoin as a currency and store of value. The 1st is debasement of traditional fiat currencies and 2nd to eliminate counterparty risk to the financial assets that I hold. If the IBM/central bank blockchain system comes to fruition in the way described by the IBM source, it is difficult so see how this system would compete with these two main fundamental reasons for investing in and holding Bitcoin. Along with all the other reasons above, there is a lot of hope that Bitcoin will continue to lead the way against competition; to a fairer global financial system in the future. It has recently been reported that major UK brokerage Hargreaves Lansdown currently managing around £40 billion in client assets has launched a price war in the brokerage industry, signalling possible future savings for retail investors in particular. It could be suggested that such a move may be premeditated to offset any negative PR in response to the upcoming Retail Distribution Review (RDR) in April headed up by the FCA. One of the reviews aim’s is to bring greater transparency to the brokerage industry’s widely used pricing model where trail commission is extensively used between fund manager and Brokerage as compensation for facilitating and promoting investments, in particular for popular Open & Close ended funds. Whether or not the use of trail commission model is actually a negative for retail investors is debateable, however, whilst regulators and brokerages tinker around with pricing models, potentially a much greater problem for the brokerage industry and financial service industry is currently looming on the horizon. It’s a threat from the world of Bitcoin and crypto currencies and it could truly lead to increased competition and much lower prices for investors in the financial markets. ‘Bitcoin 2.0’ has recently been coined to describe the growing trend of alternate uses for the Bitcoin network protocol. The Bitcoin ‘Blockchain’ (the decentralised public accounting ledger) is essentially a massive distributed asset registration system and this technology may soon be competing with the current function of (CSD’s) central security depositories and international central security depositories (ICSD’s). These systems currently facilitate the electronic settlement of securities all over the world and include banks and brokerages that act as centralised registrars for assets within these systems; where things such as the trade, currency for the trade, registration of asset ownership and tax payments are settled between registrars for a wide range of securities. But just as Bitcoin has ushered in a new era of decentralised global digital currencies that facilitate frictionless, low cost, efficient transfer of value outside of the control of governments and financial institutions, there are ongoing projects under way to do the same thing with other financial assets. Issuance and secondary market trading of Stock, ETF’s, VCT’s, Investment trusts, OEIC’s and CEIC’s, Corporate and sovereign bond. In any situation where proof of ownership needs to be registered or facilitated, these systems have the potential to remove the middleman and would therefore at the least provide increased competition and at the most threaten the very existence of brokerages and financial institutions that provide these services as a large part of their business model. At the moment there are multiple CSD’s and ICSD’s that investment funds and companies have to be registered with on individual basis to make their financial product eligible for purchase and trading in that jurisdiction or region. With the decentralised method shown above the medium of trading and purchase will simply be through the internet. This has the potential to be one of the greatest examples of lean engineering ever witnessed. For entities such as Investment funds or companies issuing stock or financial products, they instantly have access to a much larger global market, reduced administration costs and the removal of costs associated with the third party financial institution and it would also have the potential to decrease the time it takes to roll out financial products. All of this could potentially lead to reduced management fees and or lower spreads which again is another benefit to potential investors. Other advantages to the investor is being able to be in essence, their own brokerage, which means they will not be paying the considerable fees that facilitate the overheads of the brokerage or financial institution. These include, buy & sell trading fees, exit fees, transfer fees, account closing fees, annual management charges for specific accounts. This frees up more capital that can be invested to further support growth and innovation. In addition the investor could easily have access to a much larger pool of investment markets and financial products that are often restricted through certain brokerages and financial institutions. One other area that could be significantly improved is the integrity of the markets. It is no secret that since 2008 especially there have been multiple instances and revelations of market manipulation by the big banks in particular, including Libor manipulation that affected hundreds of trillions of dollars in assets benchmarked to this rate. Bitcoin 2.0 can provide triple entry accounting, completely eliminating the possibility of manipulation and alleged naked short selling that has been so prevalent in recent times. There are significant challenges to overcome before such a system is fully developed and easily accessible for main stream use, one of which (besides technological development) is the navigation of the international regulatory landscape. However, it will hopefully bring much needed competition to a financial services sector that has become growingly complacent with archaic infrastructure, considerable fees and a severe deterioration in integrity. We have already seen positive signs of remittance service providers dropping prices for sending money abroad, which could be attributed to the rapid growth of Bitcoin. Could Bitcoin 2.0 about to have the same impact upon other financial services in the near future?